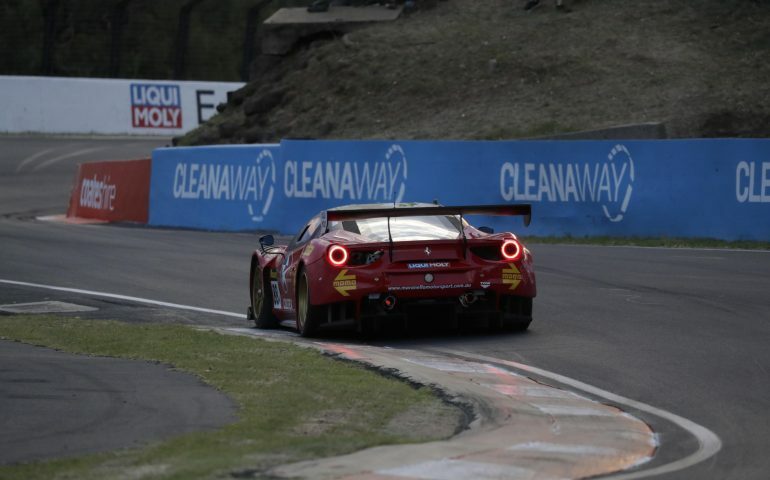 Maranello Motorsport continues to lead in the #88 Ferrari as the Liqui Moly Bathurst 12 Hour passes the nine hour mark. Leading the classes are #88 (Liqui-Moly GT3 Pro-Pro), the #12 (BRM Watches GT3 Pro-AM), the #912 (Rydges Bathurst GT3 AM), the #21 Steve Richards Motorsport Porsche (myPlates Class B GT3), the #91 MARC Cars Australia Focus V8 (Racer Industries Class I) and the #48 Interlloy M Motorsport KTM X-Bow (Avis Class C). Hour six started under safety car following the dramas for the #7 Team Castrol Vodafone BMW M6, but that didn’t stop the #48 Interlloy M Motorsport X Bow KTM getting into strife – catching fire before the bonnet flew up and obscured the windscreen. The field got back under green running conditions at 11.46am, with five minutes of running before yet another safety car was required for the #5 GT Motorsport Audi which found itself beached in the gravel trap at Virgin Australia Corner. Leading at this point was the #22 Mercedes-AMG Team STM/HTP Motorsport Mercedes AMG piloted by Shane van Gisbergen, from Craig Lowndes in the #88 Maranello Motorsport Ferrari and the #12 Competition Motorsport powered by Ice Break Porsche 911, driven by Patrick Long. The green flags flew once again at 12.00pm. Soon after, the #55 RA Motorsports Ginetta was forced to pit lane with a left rear puncture, while the #90 Castrol MARC Cars Australia BMW M6 also found itself back in the garage with continuing issues. The field ran unimpeded for 35 minutes, at which point the #41 Brookspeed Porsche got itself stuck at the Caltex Chase for the 12th safety car of the race. Under this SC, the leaders took advantage creating a race in the pit lane. The top five all stopped, and with the #88 not taking on tyres it ensured that Toni Vilander (taking over from Lowndes) was able to exit the pit lane first ahead of the #22 – now piloted by Craig Baird. When the race restarted at 12.48pm with 165 laps completed, there were again six cars on the lead lap as the #912 Walkinshaw GT3 Porsche 911 had made a strong strategy call to stay out under the SC, getting its lap back in the process. Soon, it was the #24 Nissan Motorsport Nissan GT-R’s turn to have more dramas, into the garage with the car stuck in fourth gear. Ten minutes later, the #61 stopped on the circuit but was able to resume and roll slowly to the pits, while the #54 Donut King MARC Cars Australia Focus V8 brought out the 12th safety car at 1.12pm after hitting the wall on the way in to the Audi Cutting. The restart came at 1.24pm at 179 laps, with Vilander wasting no time pulling a gap over the other front runners right from the get go – punching out the best race lap since the beginnings of today’s race with a 2m 04.2s effort followed up with a 2m 03.944s lap. It was soon time for another safety car, with the 13th for the race called at 1.53pm for the #55 RA Motorsports Ginetta which crashed at the Sparesbox Dipper. The top three (#88, #22 and #12) would pit under the safety car, elevating the #17 Bentley Team M-Sport Bentley Continental GT3 to the lead. Also pitting under the safety car were the #1 Tekno Autosports McLaren GT and the #3 Team ASR Audi R8, with the pair attempting a strategy play to outlast the leaders. At 2.15pm it was time for the tension in the front pack to explode. Third placed Patrick Long in the #12 spun second placed #22 (Maro Engel) in the middle of the Caltex Chase. While both resumed and continued, Long lost four seconds and moved to third while Engel lost six seconds and dropped to fourth, while Vilander (#88) moved up to second from fourth. The incident was investigated by race control, with Long handed a pit lane penalty at 2.25pm for the incident – Long served the penalty immediately, re-joining in fourth behind Engel. In the meantime, Vilander bumped Smith (#17) down to second to take control of the race. As the ninth hour drew to a close, the 14th safety car was called when the #66 Hobson Motorsport Nissan GT-R found very heavy impact with the Sparesbox Dipper. The #17 Bentley was very quick to react, in the pits immediately – dropping from second to fourth. Engel then came in from second place in the #22. At the time of closing this update, the #88 Maranello Motorsport Ferrari remains in the lead. Across the past three hours, a number of entries were penalised by race control, including #32 JBS Australia Lago Racing Lamborghini (driving conduct for incident with #5), #19 PROsport Performance Porsche Cayman PRO (pit stop procedure breach x 2), #83 (pit stop procedure breach) and the #2 DJS Racing Audi (pit lane speed limit breach x 2).